Working in an alliance with international partners like CUT, CONTRAF, the Sao Paulo Bankers Union, along with support from partners like UNI Global Union, CWA is initiating a campaign to help finance industry workers in the U.S. gain a voice in the workplace. The financial sector is currently the least unionized in the country despite having the largest footprint on the U.S. economy. Despite being heavily unionized everywhere else in the world, bank workers have few rights in the U.S. and international banks point to poor conditions in the here as justification for cutting costs elsewhere. The importance of this campaign extends beyond improving, or maintaining, conditions for individual workers however. CWA believes that many of the abuses of the financial industry which caused the 2008 crash, including unethical actions and predatory lending could in fact have been prevented if workers had the protection to speak with an independent voice and whistleblower protections. Currently, workers in the finance industry in Sao Paulo have a better standard of living than those in NYC because they are part of a vibrant and democratic union in Brazil. 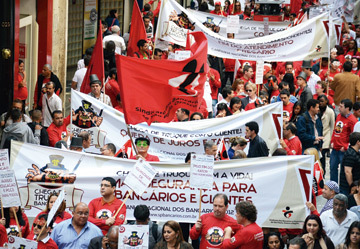 CWA will work in alliance with the Brazilian unions to help U.S. based workers build their own organization. CWA believes that customer service professionals in the banking industry are there because they want to help customers, and wants to be there to support them in that important work.